A Ring of Fire appears to be setting up for the Upper Midwest. 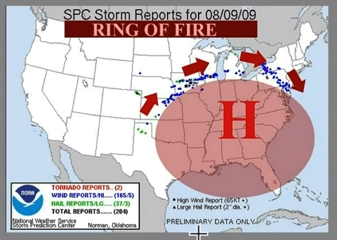 While not to be confused with the Johnny Cash song, the Ring of Fire is an atmospheric set up that can bring both heat and thunderstorms to our region. 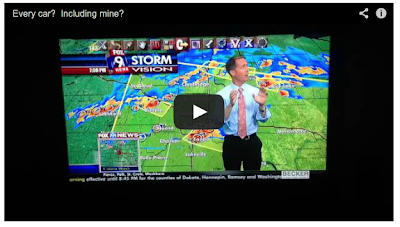 We sat down with Tom Novak from @NovakWeather to discuss this phenomenon. Call it the Weathermen Storm of '13? We live in a time when it seems that every weather event requires a name. (See also Dome Buster, Snowmageddon and the Weather Channel's stated desire to name every "major" storm.) Outside of tropical storms that come with formal naming criteria, summer storms, with their more isolated impacts, typically escape the naming process. But after last night's severe storms exacted their wrath on the property of two local forecasters, we suggest calling it the Weathermen Storm of '13. OK, so it doesn't have the magic of the storms listed above, but it's true. Read on. MPR's Paul Huttner, who often details extreme weather in distant corners of Minnesota, was chased out of his weather lab in Deephaven by a microburst. Paul's account and photos paint quite a chilly scenario. And just up the road in Eden Prairie, Fox9's Ian Leonard was a victim of golf ball-size hail, which knocked out car windshields in the station's parking lot, including his. Ian learned of the calamity while on air, and the change in his delivery when he realizes the severe weather has struck a little too close to home is noticeable.